I watched the movie ‘Jab we met’ again over the weekend. This time it made me think very differently. It reminded me of the movie, Queen. Geet meets Aditya Kashyap who she eventually falls in love with him. Aditya is not a cowardly idiot like Anshuman. He cares about her and likes her for who she is. Aditya literally rescues her. They live happily ever after. 2. Rani (Queen) ends up going on her honeymoon alone. There she sees life outside the confines of her life in Delhi. She makes friends from different walks of life, including a boy who has lost his family in Tsunami yet tries to be cheerful in life. She discovers an identity for herself, as she meets people who appreciate her culinary talents, increasing her self-worth. 3. Anshuman and Vijay, the respective exes of these women realize their mistake and come back. Geet and Rani get to dump them this time. I completely support the endings, and like the way they were empowering for women. But do all men actually realize their mistake, regret their actions, and come back? The world would have been a much more perfect place. In reality, people dump somebody for good. They may not come back. What about women who don’t necessarily find another man like Geet? What about the ones who don’t get to travel like Queen but continue their routine life feeling worthless after getting dumped? Living each day with a spout of misery with the most cherished moments of their lives becoming mere memories and evoking mixed feelings? How do they ‘get over’ someone? I am not a therapist, but still that would not deter me from expressing my thoughts on the subject. The world is a big and weird place. There are all kinds of complicated people. Anything can happen. Stop torturing yourself with ‘Why,’ and ‘What ifs’. There is nothing you can do to change things. 2. Try some kind of fitness regime. Whenever I have done any form of exercise on a regular basis, I have felt good about myself. Set a goal. For example 30 minutes on the treadmill. When you achieve it, you will feel like you are in control of at least something in your life. Aspects of your life like relationships that involve another person may not be controlled. But this is something you alone can accomplish. 3. Get out of the house. I don’t mean to go and date. Focus on your interests other than men (I know I have used this line in my previous articles, I guess I just love it). You may not immediately wish to travel alone or with friends. The thought may make you feel sorry for yourself (as you would have rather gone with a significant other). Then don’t do it. But go for a movie, play, poetry recital anything that you find doable and affordable. Then keep doing it regularly. 4. Try working towards self-growth. You must have heard that ‘Living well is the biggest revenge’. Resist the urge to immediately find someone else to spite your ex. Do not be the other extreme either – Swear to ‘ruin’ your life by staying single to make him feel guilty. Instead, try to become better (eventually more successful) in whatever you are working on. 5. Take care of yourself. Go pamper yourself with a spa or a facial. Look good. When I was younger I used to think that being good looking was a pre-requisite for looking good. But over the years, the definition of ‘looking good’ has changed. My friend’s mother is undergoing chemotherapy. She has lost all her hair. She sent me a picture of the mother recently, bald and lean. She was a very beautiful woman, and it pained me to her this way. But there was something lively about her picture. She had put on a dark maroon lipstick, enough to brighten up her face. ‘Aunty is looking good’, I had texted her. Was I saying something inappropriate? Is it okay to say that when someone is suffering from cancer? She had replied, ‘Yes, she is better. Thanks’. Another woman I knew lost her husband unexpectedly few years ago. She was unhappy for the longest time. Her daughter posted a picture of her from one of their recent vacations captioned, ‘Mummy wearing salwar suit for the first time’. It was a very natural picture. She was not even smiling. She looked consciously at the camera, squinting her eyes probably because of the blazing sun. The salwar suit was also very ordinary. She looked more graceful in her saris. But everybody had complimented her, including me. What made her look good? Maybe the fact that she had put in effort to do something different. She had hope. Hope that although she had lost the most precious part of her life, she was still trying to make the best of whatever she had left. So finally to all the Geets without Aditya Kashyap, and the Queens without international vacations, your life is still big and potentially beautiful. Look around you. Everyone is struggling with something or the other. You may not necessarily get an opportunity to ‘dump’ anyone the next time around like these women, but you can dump your negative thoughts for the time being. Life is a series of mundane days with some temporary highs, followed by longer ‘low’ phases. Give it sometime. Things will fall in place. Kavya checked her phone for the 30th time in the past half an hour. Kunal – Last seen today at 11:48 p.m.
She checked her phone again. No call. No text. Maybe he lost his phone… But then how come he was online at 11:48? Something would have happened… He must be really sick. Maybe he got a call in emergency, and had to leave town. Or maybe I should just go make tea. By the time I am done, he would have texted. Kavya had been dating Kunal for the past six months. He was everything she could have ever asked for. Good looking, suave, and charming. But something was not right. He would never introduce her to his friends, or meet hers. He would disappear for days, only to come back saying that he had been awfully busy. Kavya always chose to believe him despite her friends saying that she was dating a ghost. Why did she always believe him? Because it was easier. She was not protecting him. She was protecting herself. Protecting herself from accepting the blame for poor judgment. Protecting herself from feeling unworthy of love. Protecting herself from being alone. She was lost in her thoughts. Until the doorbell rang. Her roommate, Sanaya who was almost 10 years older had returned from her business trip. Her boyfriend, Amaan had picked up her from the airport and dropped her to their place. Kavya felt a pinch of jealousy. Kunal would have never done that. He never even stayed back at her place at night because he had to get up early in the morning. What made Sanaya such a worthy girlfriend? Where did she lack? Kavya thought feeling bitter. She was pretty, smart, caring, and loyal. What more could Kunal possibly want? Why did he keep saying he did not want to commit? She would not pressurize him. She was afraid of losing him, after all these months! If only she would stick around, one day he would realize her worth. “You are so lucky, Sanaya. Amaan really cares for you. Why can’t I get a guy like that?” Kavya told Sanaya as she checked her phone again. “Because you settle for guys like Kunal who do not value you. You think ALL the guys I ever met were really into me? But once I realized that they were not, I had the courage to move away from them, even if it meant being alone. Kunal looked at his phone. It had been quite a few days since Kavya had texted him. Strange. A girl as clingy as her would just disappear? Had she found someone else. So soon? Had she blocked him? Her profile photo was blurred. He clicked it. It was a picture of some animated, fairy-tale like character. Where had he seen that before? His niece had made him buy a school bag with that blue picture…. 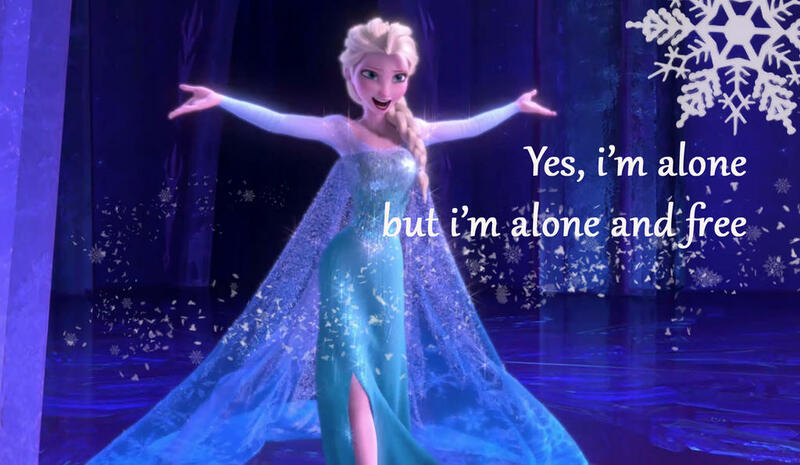 Yes, I am alone. But I am alone and free. My mother passed the ringing phone to my while I was working on my laptop. Ravish Tinder: flashed the contact. Mom: What kind of name is Ravish Tinder? Me: Tinder is a dating app. Mom: Dating app!! You watch Crime Patrol. Don’t you know how dangerous these things are? Me: In a country where we marry strangers through shaadi.com, I don’t think we should be too concerned! I felt very satisfied with my response, as if I won. But did I? There are broadly two kinds of marriages in India – arranged marriages where very determined well-wishers find us a match with astronomical perfection or love marriages in which people magically meet like a fairystyle through divine interventions. Finding someone through dating apps fall in neither! Not traditional enough like shaadi.com and not natural enough like DDLJ. The truth is I was quite skeptical about joining a dating app. There is always the extreme fear of meeting a psychopath / creep or the lesser yet disappointing experience of meeting someone uninteresting / annoying not worth the effort. As much as I would love to imagine that the whole universe will conspire to make me meet my soulmate, reality is I am a 28 year old working woman, who meets limited people. My social circles are dominated by men who are already married or committed. The ones who are not committed are not committed for a reason. They loathe commitment! We as women should become more open to the idea of finding a partner for ourselves. It is not our parents’ responsibility. Our parents do not know what kind of men we find interesting / attractive. We should spare them the pain of scrutinizing and exchanging profiles with another set of equally clueless yet harassed parents. There is nothing wrong with the desire to seek a partner, and these mediums are quite relevant in today’s time. And it need not always be about dating. While some apps are more marriage oriented such as Aisle, others like Floh could create a great platform for making friends. Technology has provided us the means to connect to people from different spheres of life who we could otherwise never have found. Whether I meet Mr. Right or Mr. Right Now, or encounter a bunch of frogs and no prince, for now the thought to ‘make it happen’ is very empowering! Not many knew the truth about my father absence’s in our life. One fine day, she found herself left with only me – a six year old to cling on. Even lady luck did not favor her. Her father passed away two months after her spouse left her. Since then, she braved everything all alone, while she ensured that I have a good education and was raised as a better human being. We made sure we hid this fact to avoid many troubles at work and school. His absence was camouflaged by transfer to some rural area. We made sure we did this so that the world does not bother us with unnecessary threats, advice, advances, gossips, lewd remarks. It would have been difficult for her when her colleagues would ask about her spouse and she had to build a story. It would have been difficult for her when she was often reminded that she was raising a girl child all alone. Today when I recall all this, I only wished that our society was less penalizing on single mothers. I wished friends and especially relatives stopped pointing fingers at the women for the loss or mishap. I wished people stopped looking down at them as inauspicious. I wished schools were more sensitive in such cases rather than pestering for father’s signature in the report card. Today, I want to raise a toast to all single mothers. Destiny would have given you a hard life ahead. However I really urge you all to stand up and keep going. Trust that there is light and one day you will find it in your child’s eyes, when she/he would have grown up to be an independent and confident person.